Ph.D. (Plant Physiology), University of California, Davis, U.S.A.
B.A. (Botany), University of California, Berkeley, U.S.A.
Our research program focuses on the molecular physiology and genetics of plant mineral nutrition and root biology with emphasis on plant responses to abiotic stresses in the soil. 1. How do crop plants adapt to low availability of mineral nutrients and water in the soil? To identify the mechanisms and underlying genes for tolerance to low nutrient availability, we are developing high throughput root phenotyping platforms to quantify root structure, architecture and function. Quantitative descriptors of root architecture and function are mined via whole genome analyses in order to identify genes and markers underlying these traits for developing crops with improved root traits via molecular breeding. An example of this type of research has involved the development of novel digital tools for imaging whole root systems of crop plant species in two- and three-dimensions, and using the quantitative data for root architecture traits in order to facilitate the genetic mapping of different components of root architecture. 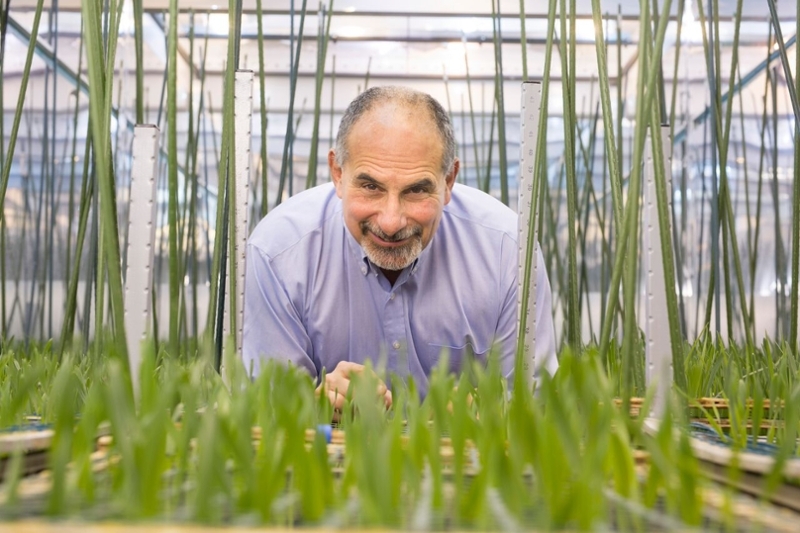 The goals of this research are to identify genes that contribute to root system architecture traits that facilitate the uptake of sparingly available nutrients, with a focus on N, P, K and micronutrient acquisition and water uptake under drought conditions. 2. How do crop plants tolerate the abiotic stresses on acid soils, as these acid soils comprise up to 50% of the world’s potentially arable lands? This research involves identifying genes and the associated physiological mechanisms that confer tolerance to a major stress on acid soils, aluminum (Al) toxicity. We have cloned a number of Al tolerance genes in the cereal crops sorghum, maize and rice, and are studying how these genes function and are regulated. We are also investigating plant tolerance to the other primary stress on acid soils, phosphorous deficiency, with a focus on the role of root architecture in this trait (see above). Finally, we are collaborating with the Embrapa Maize and Sorghum Laboratory in Brazil and plant breeders in Africa to translate these discoveries into improved maize and sorghum yields on acid soils in Sub-Saharan Africa. 3. Research on fundamental aspects of plant mineral nutrient transport with emphasis on improving the accumulation and the availability of Fe and Zn in cereal seeds and minimizing the entry of toxic heavy metals and metalloids such as Cd and As into the food chain. Zhang Z, Zheng , Ham B-K, Chen J, Yoshida A, Kochian LV, Fei Z, Lucas WJ. 2016. Vascular-mediated signalling involved in early phosphate stress response in plants. Nature Plants 2: 16033. Piñeros MA, Larson BG, Shaff JE, Schneider DJ, Falcão AX, Yuan L, Clark RT, Craft EJ, Davis TW, Pradier PL, Shaw NM, Assaranurak I, McCouch SR, Sturrock C, Bennett M, Kochian LV. 2016. Evolving technologies for growing, imaging, and analyzing 3D root system architecture of crop plants. J Integrative Plant Biol 58: 230–241. Carvalho, G., Schaffert, R.E., Malosetti, M., Viana, J.H.M., Menezes, C.B., Silva, L.A., Guimaraes, C.T., Coelho, A.M., Kochian, L.V., van Eeuwijk, F.A. and Magalhaes, J.V. 2016. Back to acid soil fields: the citrate transporter SbMATE is a major asset for sustainable grain yield for sorghum cultivated on acid soils. G3: Genes| Genomes| Genetics, 6: 497-484. Brauer EK, Ahsan N, Dale R, Kato N, Coluccio AE, Piñeros MA, Kochian LV, Thelen JJ, Popescu SC. 2016. Integrin-linked kinase1 and the high affinity k+ transporter HAK5 contribute to ıon homeostasis and signaling during ınnate ımmunity. Plant Physiol 171: 1470-1484. Kochian LV, Piñeros MA, Liu J, Magalhaes JV. 2015. Plant adaptation to acid soils: The molecular basis for crop aluminum resistance. Annual Review of Plant Biology 66: 571-598. Hart JJ, Tako E, Kochian LV, Glahn RP. 2015. Identification of black bean (Phaseolus vulgaris L.) polyphenols that inhibit and promote iron uptake by Caco2 Cells. J Agric and Food Chem 63: 5950-5956. Hufnagel B, de Sousa SM, Assis L, Guimaraes CT, Leiser W, Azevedo GC, Negri B, Larson BG, Shaff JE, Pastina MM, Barros BA, Weltzien E,. Rattunde FFW, Viana JH, Clark RT, Falcão A, Gazaffi R, Garcia AAF, Schaffert RE, Kochian LV, Magalhaes JV. 2014. Duplicate and conquer: Multiple homologs of PHOSPHORUS-STARVATION TOLERANCE1 enhance phosphorus acquisition and sorghum performance on low-phosphorus soils. Plant Physiol 166: 159-167. Zhai Z, Gayomba SR, Jung H, Vimalakumari NK, Pineros M, Craft E, Rutzke M, Danku J, Lahner JB, Punshon T, Guerinot ML, Salt DE, Kochian LV, Vatamaniuk OK. 2014. OPT3 is a phloem-specific iron transporter that is essential for shoot-to-root iron signaling and redistribution of iron and cadmium in Arabidopsis thaliana. Plant Cell 226: 2249–2264. Milner MJ, Mitani-Ueno M, Yamaji N, Yokosho K, Craft E, Fei Z, Ebbs S, Zambrano MC, Ma JF, Kochian LV. 2014. Root and shoot transcriptome analysis of two ecotypes of Noccaea caerulescens uncovers the role of NcNramp1 in Cd hyperaccumulation. Plant J 78: 398-410. Li JY, Liu J, Dong D, Jia X, McCouch SR, Kochian LV. 2014. Natural variation in Nramp (NRAT1) expression and function that play a key role in rice aluminum tolerance. Proc Natl Acad Sci USA 111: 6503-6508. Schroeder JI, Delhaize E, Frommer WB, Guerinot ML, Harrison MJ, Herrera-Estrella L, Horie T, Kochian LV, Munns R, Nishizawa NK, Tsay Y-F, Sanders D. 2013. Using membrane transporters to improve crops for sustainable food production. Nature 497: 60 - 66. Sivaguru M*, Liu JL*, Kochian LV. 2013. Targeted expression of SbMATE in the root distal transition zone is responsible for sorghum aluminum resistance. Plant J 76: 297–307. (*Co-first authors). Fang S, Clark RT, Zheng Y, Iyer-Pascuzzi AS, Weitz JS, Kochian LV, Edelsbrunner H, Liao H, Benfey PN. 2013. Evidence for genotype-dependent recognition by rice roots. Proc Natl Acad Sci USA 110: 2670-2675. Maron LG, Guimarães CT, Kirst M, Albert PS, Birchler JA, Bradbury P, Buckler ES, Coluccio AE, Danilova TV, Kudrna D, Magalhaes JV, Piñeros MA, Schatz MC, Wing R, Kochian LV. 2013. Aluminum tolerance is associated with higher MATE1 gene copy-number in maize. Proc Natl Acad Sci USA 110: 5241-5246.